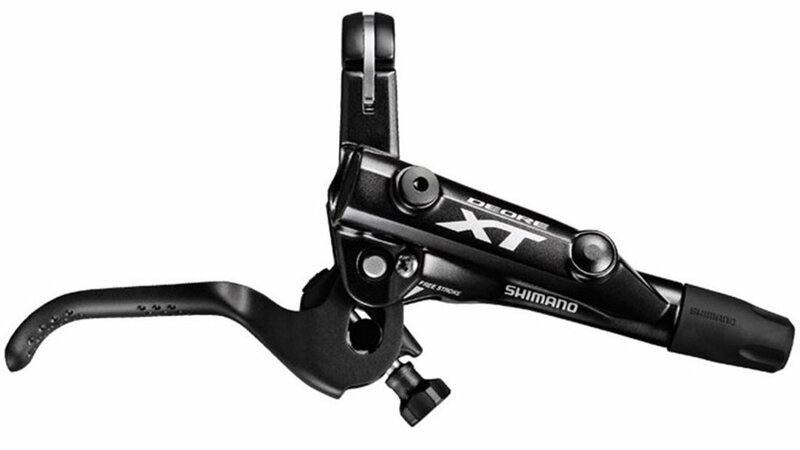 The Shimano XT BL-M8000 Disc Brake Lever offers the consistent, predictable and powerful performance you expect from the company, and also it's a Rider Tuned brake system, with an integrated design so important in today's world of busy cockpits. You'll find easy maintenance with this Deore-level lever, and enjoy the sleek and durable, plus clean cylinder design with the company's I-Specii tech. Went on easily, as expected, and does what it's supposed to do. The design of the attachment for one-by Vs two-by is nothing short of brilliant. I highly recommend this product. The only reason I'm replacing mine is because the product doesn't like to be smashed into an oak tree at warp speed. And frankly, neither did I.
Replacied an M988 lever, just as much power with better mudulation. Definitely recommend as one of the best brakes there is. They just work. Superb feel and have stopped me in any condition I have thrown at them. I bougth these levers because I got a pair of Saint calipers (hoses included) so, using the XT levers I have a new high line brake set with a lower price. The quality is not against the price when we are talking with shimano stuff. Very good quality, easy to install / bleed, love the reach adjustment.. but not sure what is free stroke. Upgraded my SLX levers and wow, what a difference! Shimano brakes are easy to work on, bleed easy and I love the snap they have when they hit the disk. Nothing better! I bought this to replace my 1 year old brake lever as the cylinder had freezed up. Upon taking the lever apart and putting back together to clean it the area where the piston moves in snapped. This was an easy replacement and easy to install. I love these brakes. I know they will work as expected every time I use them. They are very reliable and consistent. I like the feel of the short levels with groves on the levers for grips. I paired these with new Shimano brake rotors as well. Some of my first few rides were downhill canyon trails in Utah. You will not be disappointed. Awesome quality and capability. Well priced on sale. Good craftsmanship. I've only had them a week. My prior brakes were XTR and this has the same quality and looks better than the previous XT. Perfect Replacement for broken handle without having to purchase the entire set with caliper. Great price, with fast shipping. Threaded fitting on brake fluid reservoir made bleeding brakes quick and easy. I overtightened mine. It was a 2014 bike original right sided brake (back crake) with heavy use. The mechs worked fine, but the screw insertion site wore down. Great product. Arrived on just on time. I bought it because I broke the right lever. I’m from Chile and it was impossible to find as a replacement. I’ve been using this model for more than two years and I find this brake perfect. Thanks !!! didn't last 2 miles before it started leaking & felt like hell from the get go. a freak thing I'm sure, but more than disappointing . not worth taking a chance on another, just bought a complete system next. Does anyone know if it is possible to match m355 calipers with m8000 levers? I recently upgraded the drive train to XT but not the brake. I'm happy with the calipers but find the m355 levers uncomfortable. I need the right brake lever which in my case corresponds to the rear brake. Which brake lever should I choose, the black front or the black rear? Does it come prebleeded? And does it come with the whole thing that comes in the picture? BEST ANSWER: No. You cannot bleed a lever alone. Yes, the lever only assembly pictured is what you’ll receive. Note that this does not include the olive and barb for connecting to the brake hose. Those are available separately. Yes, comes with everything you see. But you'll have to bleed the system from the caliper back to the lever. You may also want to buy a new "olive & insert" just in case the original one doesn't seal up correctly. It's a lever. There's no hose, no caliper, and no fluid. If you don't understand what this means, it's time to do research about how hydraulic brakes work. What is pictured is what you get. It's not pre-bled as there's no fluid in it at all. No doesn't, you have to bleed it cause it doesn't come with hydraulic line. BEST ANSWER: Yes, the set i received was the US set up...left is front. The left-hand lever controls the front brake/ right-hand lever the rear brake. Some people hook theirs up motocross style, which is opposite. Front is left unless on a motorcycle. Then front is right, left is clutch and right foot is rear, left foot shifts gears. Yes, front is the left -side lever and rear is the right-side lever. does the lever come with an olive and barb or do they need to be purchased separately? BEST ANSWER: The lever does not include a barb and olive, you will need to purchase these separately. If you do a lot of your own brake work, I suggest purchasing a large quantity all at once. You'll have to purchase that separately. Can I pair with deore xt brake lever without replacing the hose? BEST ANSWER: The XT lever and that caliper/brake line will not be compatible. That brake uses a SM-BH59 line.. ideally with the XT lever you would want to use SM-BH90 line. No, the M447s use a different hose fitting (BH59) than the M8000 levers (BH90). Does not look like it. The fitting on the hose on both calipers are different and they are on different sides. Does this lever comes pre-bled? And can I pair them with other Shimano calipers? BEST ANSWER: It is not pre-bled, because it's just the brake lever. Bleeding is easy, just get the bleed kit and watch some YouTube videos. You can pair these with all current Shimano calipers. This lever comes dry, you need assemble the circuit and bleed it. This will work with another Shimano calipers, I am using it with Saint calipers. It is pre bled and I paired them with an old 2014 shimano caliper. Works good and better than before. I need the left brake lever for front, what option should i choose? BEST ANSWER: If you have to ask this question, you should have a bike shop do this work. BEST ANSWER: I have them paired with m675 SLX caliper and work great. Is this compatible with an i-spec ii rear shifter? BEST ANSWER: Yes, these are i-Spec II compatible. i-Spec II is not backwards compatible with the old i-Spec A and B shifters. Can I pair with Shimano deore br m615 or br m 7000 slx brakes without replacing the hose? BEST ANSWER: Yes, it will fit, but you will need new compression fittings for the lever end. Can I pair with other Shimano hoses? BEST ANSWER: Nope, compatible with BH90 hose ONLY. Other hoses or fittings will leak. Does this come with a brake hose? BEST ANSWER: This is sold as the lever only. Hose and fittings sold separately. I have attached the compatible hose kit. I'm doing a flat-bar road conversion. Can I use these levers with the BR-R8070 calipers?